Cambodia is situated in the southern region of the Indochina Peninsula in Southeast Asia. Cambodia shares its northwest border with Thailand and to the northeast, it borders Laos. Vietnam lies to the east of Cambodia, while on the west lies the Gulf of Thailand. When planning a visit to Cambodia, travelers must check the immigration requirements before getting their visa and air ticket. Most visitors to Cambodia can easily obtain a visa upon arrival at the airport. However, in the case of some countries, passengers are highly recommended to obtain both their visas and air tickets well in advance. Those nations are Afghanistan, Algeria, Saudi Arabia, Bangladesh, Iran, Iraq, Pakistan, Sri Lanka, Sudan, and Nigeria. Visitors from these nations must have a valid passport, visa and air ticket to Cambodia. Travelers planning to receive a visa at the airport can purchase a Cambodian visa valid for a maximum of one month. The passenger must have a passport valid for a minimum of 6 months and 1 recent passport-sized photograph. A departure tax is charged on all air tickets, both domestic and international flights. Visitors may bring video equipment, cameras, radios, watches, lighters and cosmetics into Cambodia without any duty. All visitors are allowed to bring in a maximum of 400 individual cigarettes, 2 liters of wine and medicines for personal use. Lots of places to explore! We just got back from a well-organized trip to Cambodia via an air ticket from SilkAir. The airline services were great all the way to Cambodia. Learning to move with the traffic in Phnom Penh and realizing that pavements are not for walking on; sleeping overnight in Preah Kral Monastery; experiencing sunrise at Sra Srang, followed by a visit to the delightful Banteay Srei temple; taking a boat across the Tonle Sap Lake and along the Sangker River from Siem Reap to Battambang; hiking along paths through the jungle of Kep National Park (without a guide); being guided around Sambor Prei Kok by two charming local girls- the whole trip to Cambodia was wonderful. I've already booked my next ticket there for the winter holidays. This was our first time getting a visa and air ticket to Cambodia. We found Cambodia a fascinating country and thoroughly enjoyed our holiday. There was an awful lot to take in and see and we were pleased to have visited parts of Cambodia that are not on most tour itineraries. Towards the end of our two weeks we felt that we had acclimatized and having come to the end of our ‘taster’ were ready to begin the tour proper; such a pity we then had to come home! It has given us a desire to return at some time, both to revisit some of the locations from this trip and to explore new ones. The whole trip was brilliantly planned as we traversed through Cambodia. From the sadness of the Genocide Museum and the Killing Fields, to the mysteries of the Angkor Temples, to the cheerful greetings by all Cambodian people, there are many reasons I would love to get another air ticket to visit Cambodia again. When is the best season to visit Cambodia? Travelers can visit Cambodia any time of the year, but the most popular time to travel would be the dry season from October to April. Early summer can also be a great time to visit Cambodia, for those who don't mind higher temperatures and more frequent bouts of rainfall. Visiting Cambodia between May to June may allow for better wildlife viewing opportunities as well as fewer tourist crowds at popular sites like Angkor Wat and around Phnom Penh. The monsoon season runs from July to September. You can get a visa any time and book an air ticket to Cambodia at the time that suits you best. What type of transportation is used in Cambodia? Cambodia tours utilize a variety of transportation including private vans/cars, 4x4 vehicles, internal flights, etc. They use a mix of private/public transit to provide travelers with the safest and most efficient transportation in each area of Cambodia. Occasionally, travelers may encounter non-typical transportation modes in Cambodia (tuk-tuk, bicycle taxi, etc. ), which are recommended for short distances to give a taste of locality. What kind of food is popular in Cambodia? Khmer cuisine is closely related to its neighboring countries, although it is not as spicy. Amok (fish prepared with coconut milk and spices) is probably the most famous Cambodian dish. A wide variety of dishes are present in Cambodia such as curries, stir-fried vegetables, noodles, and soups. All meals are served with steamed rice. Western food is available only in the major cities. If you are planning to buy an air ticket and explore Cambodia, it’s a worthwhile decision to enjoy food as the locals do. Do I need to take any precautionary measures before going to Cambodia? No vaccinations are required to gain an entry visa to Cambodia with an air ticket. Visitors are advised to check in their own country regarding protection against malaria, typhoid, hepatitis A and hepatitis B. 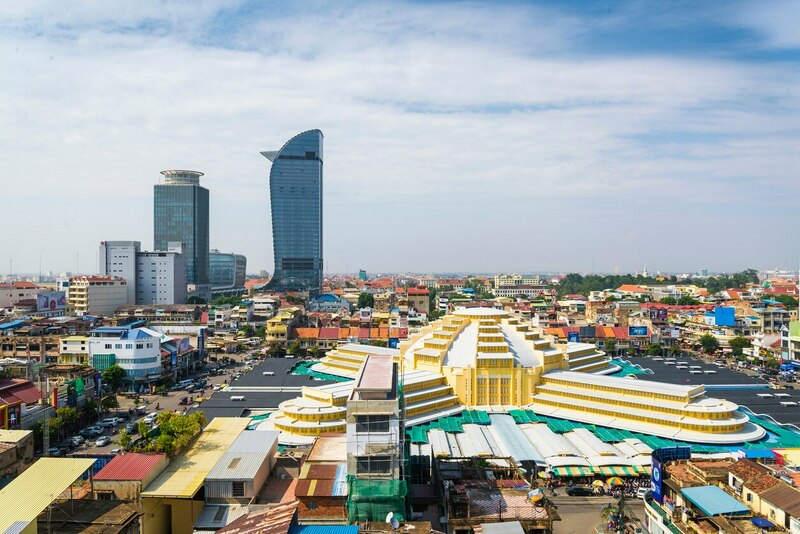 It is easy to find a foreign doctor or dentist in Phnom Penh. Siem Reap, another large Cambodian city, has a private clinic with international standards. Due to the availability of high-quality care facilities you are freely allowed to get a visa and air ticket to Cambodia. Airports handling direct flights to Siem Reap-Angkor International Airport ・Seattle-Tacoma International Airport ・Singapore Changi International Airport ・Bangkok Suvarnabhumi International Airport etc. Airports handling direct flights to Sihanouk International Airport ・Tianjin Binhai International Airport etc. Airports handling direct flights to Phnom Penh International Airport ・Singapore Changi International Airport ・Bangkok Suvarnabhumi International Airport ・Incheon International Airport ・Hong Kong International Airport etc. Most of the flights that connect to Cambodia are Emirates flights. Singapore Airlines, British Airways, Thai Airways, Malaysia Airlines and Cathay Pacific also take passengers to Cambodia. Vietnam, being the neighboring country of Cambodia, provides cheap air tickets to Cambodia on Vietnam Airlines. Qatar Airways and Asiana Airlines also offer affordable air tickets to the country.